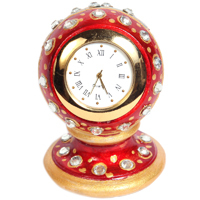 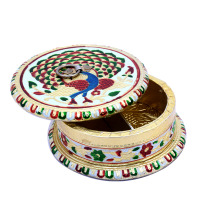 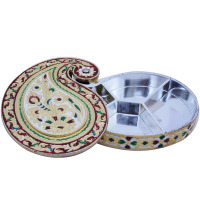 Gift your loved ones this attractive piece of gift that comes with a wooden base and a beautiful oaixidsed metal cover complete with meena work. 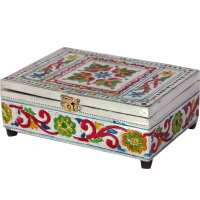 Gift your near and dear ones this appealing piece of gift that comes with a wooden base and a beautiful oaixidsed metal cover. 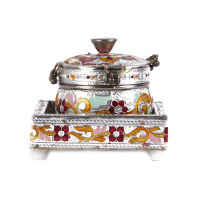 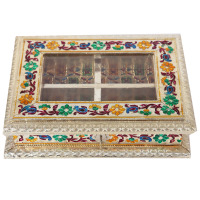 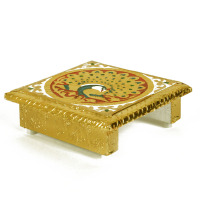 Multi coloured Meenakari designed chowki is something you wish to have at your house. 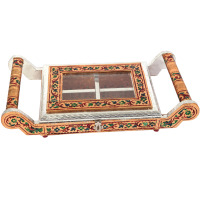 Dimensionally not so big, the chowki showcases the epic skill & artistry of Rajasthani artisan, which harmonize the beauty of this piece as always. 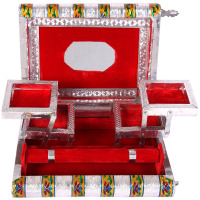 This meenakri Pooja lota made from steel is a great addition to any Pooja set. 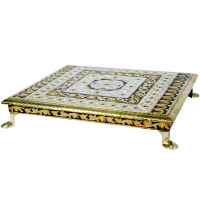 The elegant design, and craftsmanship is what makes it a best seller. 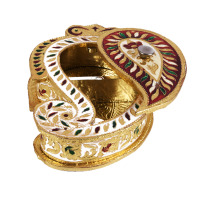 In the recent times, the definition of Meenakari has not been restricted to traditional jewellery but rather it broadens into more of present day items, like the ones with a copper base including bowls, ashtrays, key chains, vases, spoons, sculptures of gods and divider pieces. 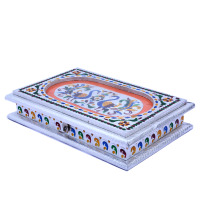 It is an incredible work that is done on surfaces of marble products usually. 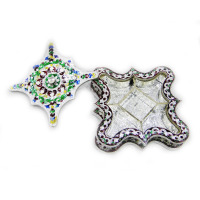 The traditional procedure begins with the designer and proceeds onward to the goldsmith, the etcher who imprints the design, the enamellist who applies the shading, the polisher, the stone setter and the stringer. 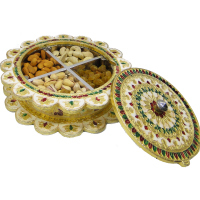 Each one of them is the main element of this essential chain of skilled workers who make the complete item. 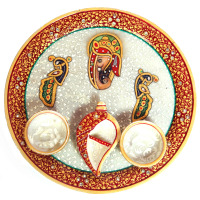 Meenakari designing fundamentally alludes to covering impressions or inscriptions on jewellery with hued polishes. 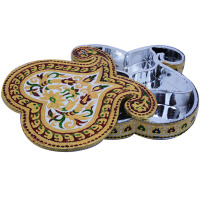 A wide assortment of metals can be utilized for meenakari designing which incorporate metals like copper, silver and gold. 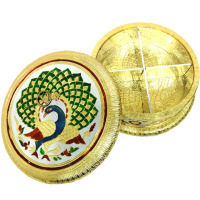 Along this, meenakari jewellery is utilized to delightfully express different themes and events and it gives them a dazzling appearance. 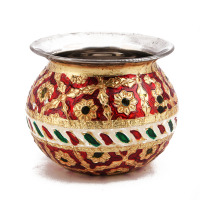 This is one of most the hailed elements of the meenakari strategy which makes it different from others. 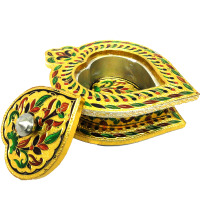 Meenakari hand art is a standout amongst the most dynamic sorts to improve your appearance. 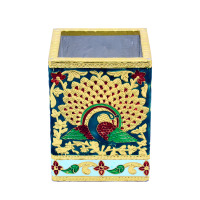 We attempt to emerge with the genuine comprehension of meenakari work including examples of winged creatures in colors like blue, green, red, yellow and green in our things. 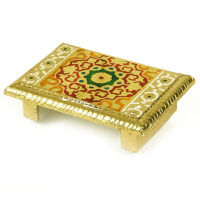 Meenakari is the best Rajasthani handicraft and has been gently made by us including a meenakari painting with lacquer which can clutch it, giving it a beautiful viewpoint. 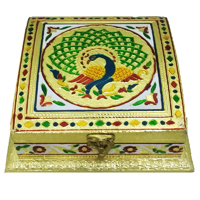 We fabricate these things which are basically used for enriching houses, workplaces, lodgings, and for gifting purposes on various events like wedding, anniversary, house warming etc..
Why Boontoon for Meenakari Handicrafts? 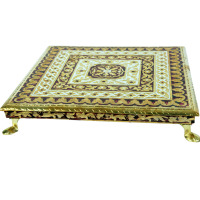 An immense scope of our Indian decorative items is accessible at Meenakari handicrafts online at Boontoon to take into account the expanding interest for the item in the neighborhood and also in the global market. 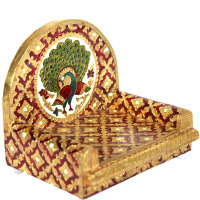 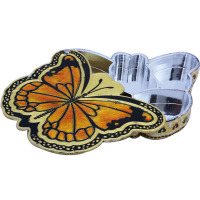 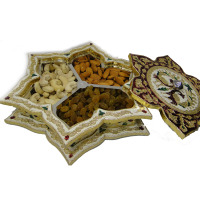 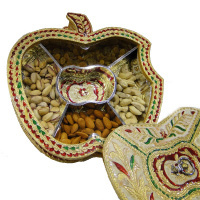 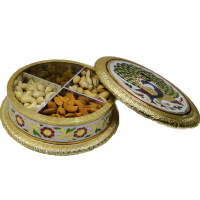 We make such meenakari handmade things accessible like dry fruit box, painting designs, little compartments, and gems at best price. 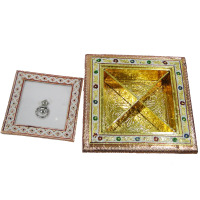 With the expansion of complicated points of interest, the meenakari works are additionally highlighted. 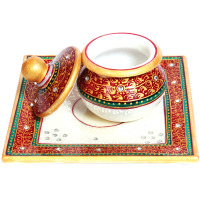 The hues add colors to the items making them appealing and lovely. 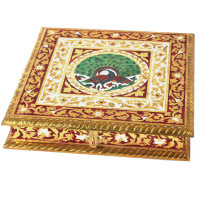 At the point when an item adorned with meenakari work is situated in any corner of the house, the whole place gets captivated, it gives a royal touch of ethnicity. 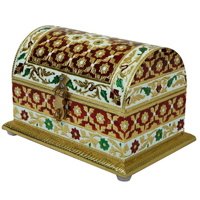 The solid examples and the utilization of strong hues give the models an extraordinary character. 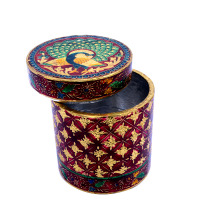 Indeed, even a basic pen stand can look interesting with the assistance of meenakari work. 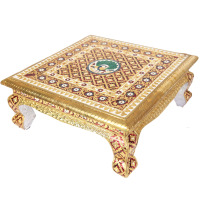 The Meenakari things, for the most part, incorporate a botanical background against which pictures of creatures and winged animals are drawn. 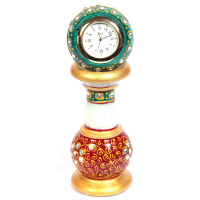 The hues highlight the question a great deal more than the designs. 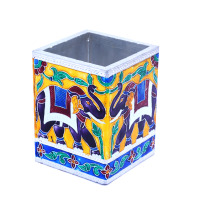 Our handicraft things acutely depict the abandoned life, its creatures and plants, and their lifestyles. 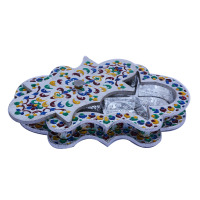 With such dynamic artworks present, any unremarkable event of nature can be enlightened. 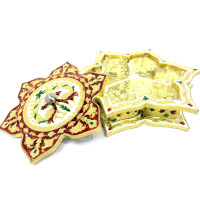 These pieces are perfect for adorning and also for gifting purposes particularly amid the marriage season as the items are customarily rich. 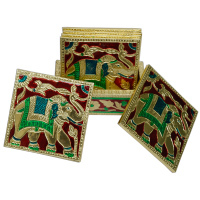 Our meenakari items are the aftereffect of the amalgamation of customary hues and current complexities of craftsmanship. 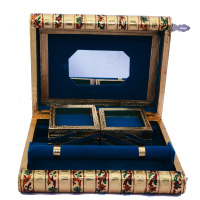 Our immaculate products are certain to enchant any individual with their shear delights.